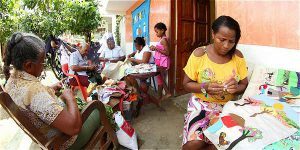 The Women Weavers of Dreams and Flavours of Peace of Mampuján are a group of displaced women from the community of Mampuján in the Montes de Maria region of Colombia which was destroyed as a result of the conflict in March 2002. In 2006 the women started to meet together to sow tapestries. They began when Juana Alicia Ruíz Hernández, an Afro-Colombian community leader who had been working with church organisers, began advocating for more psychosocial projects to support the community. At her insistence an American, Teresa Geiser, was invited to Mampuján to run a workshop on trauma healing. She introduced the women to quilting as a method to support community healing and resilience. The women started to meet regularly to sow. 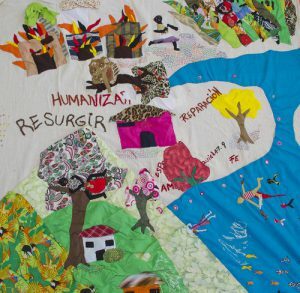 Drawing on Afro-Caribbean storytelling and local textile art traditions, instead of creating quilts, they sewed their stories, creating large tapestries that depicted the atrocities they had suffered as a community and documented their displacement. Each figure that they cut and sewed represented someone from their community. The women credit the process with being central to their process of healing and re-building, enabling them to come together and to share their pain, to commemorate and to start looking forward. Juana recalls how they cried and sewed and how gradually the crying changed to laughing. “It was a way to recover from trauma, a strategy to narrate and tell what had happened, to sit and to talk,” Juana remembers. Through these conversations, the women decided to sew the history of their people, from life in Africa, to slavery, to agriculture, in a series of tapestries. Through this process, Juana says, they learnt about the cyclical character of violence and they committed themselves to breaking the cycle. In 2008 the community of Mampuján was chosen to attend the first court hearings under the Justice and Peace Law of 2005, as part of the demobilization process. In return for a lighter sentence the commanders behind the displacement of Mampuján confessed to their crimes. In a historic court ruling, the Colombian state was ordered to pay reparations to the victims of Mampuján (2010). During one televised hearing, Juana’s husband, Alexander Villarey Pulido, publically forgave the commanders. Watching the live stream from the community Juana feared the reaction of the people who had lost everything to these men but Alexander was given a standing ovation when he finished speaking. A Canadian project volunteer notes that the community were able to publically forgive and to look forward as a result of a social healing process that had included community organising and the social healing of tapestry making that had started years before the formal transitional proceedings. The reparation process has not been smooth. Village leaders and organisers have worked hard to support the community, to defend their rights, to purse the reparations they were promised and to achieve real healing. While going through the transitional justice proceedings the women met less regularly to sew but their tapestries continued to play a role as central back drops to meetings, gatherings and their activism. In 2014, one of Mampuján’s tapestries, Travesty, was put on permanent display in the National Museum in Bogota to highlight the unique contribution of Afro-descendant communities to Colombia. It depicts the story of their ancestors’ journey from Africa to Colombia, in the hold of a slave ship. A video accompanying the quilt depicts the women sewing while narrating their current situation. In 2015, the Weavers of Mampuján were awarded the Premio Nacional de la Paz, a leading peace prize in Colombia. With the prize money they are building a network to support more women like themselves to engage in sewing and community healing and organising projects.